VPNSecure has a lot of potential but it is lacking in some important departments such as security and features. It's also a bit too pricey for the service it offers. 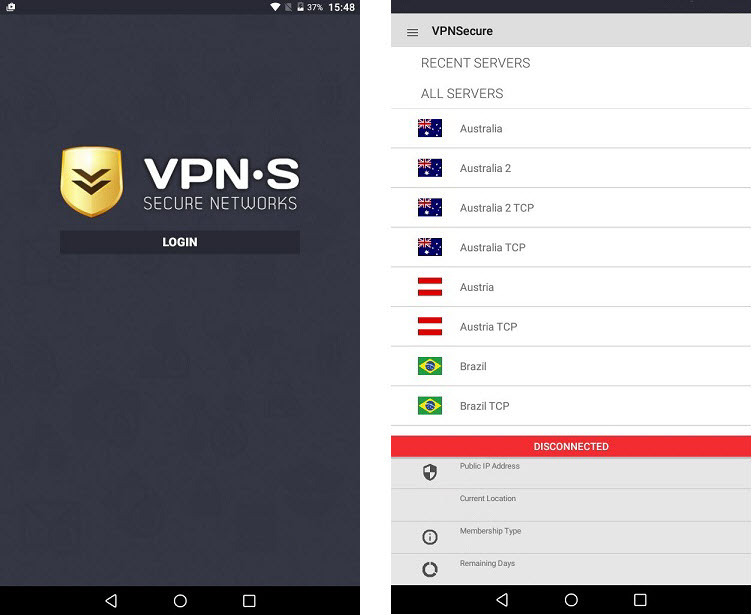 Based in Brisbane Australia, VPNSecure is a promising VPN service that provides over 60 Servers in 48 countries. 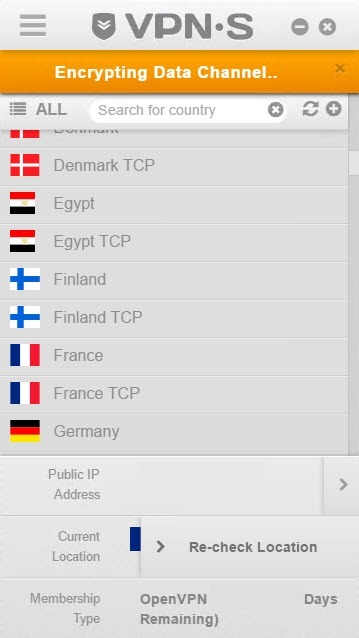 Most of the locations are generic and you will find them on the covered location list of most VPN services, but they also provide a number of servers in locations less encountered such as Israel, Malaysia or Chile. For more details on the locations available, you can check out their location list. The setup process is simple, all that is needed is an e-mail address for confirmation and for receiving the credentials once the account is up and running. They were very prompt and we received our credentials in a matter of minutes after the payment cleared. For a full list, we recommend reading the terms of service page which will have updated information on other interesting and relevant aspects of the VPN service such as DMCA notices, warrant canary, refund information and so on. VPNSecure offers proprietary software for Windows, Mac, iOS and Android. They offer support for other platforms as well but under the form of configuration files used with third party OpenVPN clients. The Windows application was rather interesting. It was very easy to use, and we especially liked that the design did not interfere with the functionality. 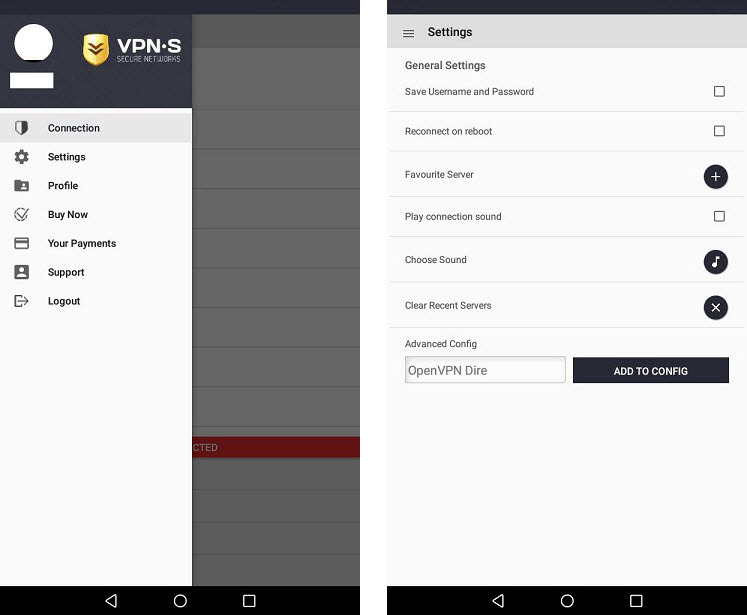 The settings page gives you additional options to customize your experience with VPNSecure. The “leak fix” feature helps with DNS leaks as shown in the information provided by them. 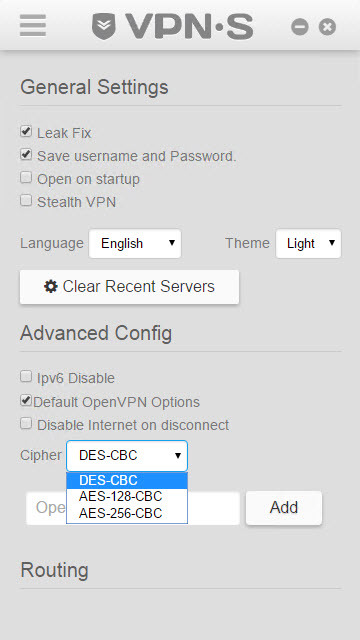 The software also gives you the possibility to change encryption type and has the settings for port forwarding if needed. Stealth VPN is a feature that pertains to the Chinese users and even though the speed is lower, they will work with any server location. Netflix doesn’t work, even on the servers marked for TV and streams (which indicate that the streaming services should be available). We normally don’t consider this as a plus or minus, but since the dedicated servers were meant for streaming services, it’s a bit odd that they don’t server their purpose. Again, this is not to say that the service has an issue, it’s very rare that Netflix services work ever since they started their battle against VPN services by banning entire non-residential IP ranges. VPNSecure also offers additional service plans and they are as follow. These are still VPN service features, and there are some VPN services that include all these in just one package (most of the times cheaper than just one of VPNSecure’s features). In our opinion these services should not be sold separately, but rather be included in one strong fully-featured VPN services that raises to the market’s standards. The encryption used is Cipher DES-CBC de 64bit for data and RSA 2048 for key exchange. This is a huge down-size to the service because DES has been obsolete for a while and is very unreliable. This is not an aspect that should be taken lightly, as VPN services are supposed to heighten your privacy level, not give a false sense of security. 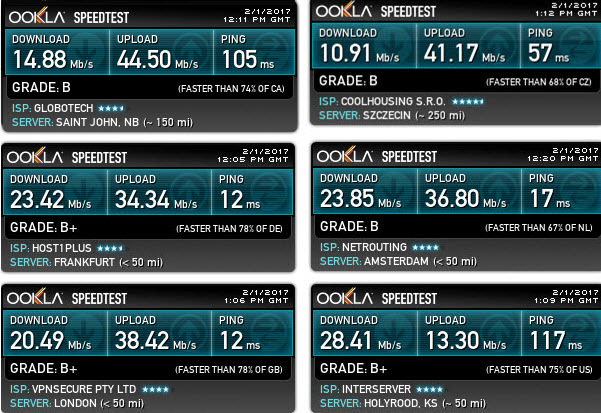 The browsing speed test results were decent for the most part, just a bit above average. The browsing experience was good, there were no issues, interruptions or delays even when streaming video content. Again, we would like to remind you that if you are interested in a specific video streaming service, it might not be available. For this reason we recommend the $2/2days plan that they have available because it will help you get a very good idea of what the service is able to provide and whether it’s sufficient for you. The torrent download speed was rather low, maxing out around 3Mbps, and it does not raise to the market’s standards in our opinion. It’s not necessarily a deal-breaker for all VPN users, but in our opinion P2P is very important, and the speed results we obtained would not suffice for our P2P needs. For your torrent needs, check our top 3 best VPNs to use for torrents in 2017. The Android application was very easy to use and we have to say it’s quite the fully-featured app. After the login screen, you have the option to select the server location of your choice and start the connection. The application also provides you the possibility to customize your experience further by accessing the settings menu. As far as the speed test results go, we weren’t exactly impressed. The results were not terrible, but it just seems like the service is limited to average quality. It’s not clear whether if this is to satisfy a specific demand, or due to a poor infrastructure, but either way, it’s not a standard that we are willing to accept. Services should strive for quality and invest in infrastructure if they want to keep up with the ever-growing demand and quality standards the mobile market requires nowadays. 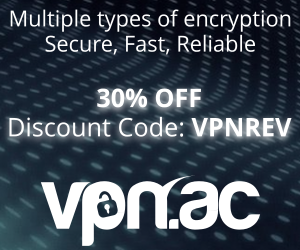 VPNSecure offers several pricing plans. We will include the plans for the additional services mentioned above, even though in our opinion, they should be included in the price. The service seems expensive, especially after taking a look at the details, speed test results and functionality, we feel that $10/mo. is a bit pricey. We understand that there are bundles that offer some generous discounts, but these are only applicable in the case where you find VPNSecure’s services to suit your needs, so it’s debatable. VPNSecure accepts several payment methods, and even though it’s not exactly the widest variety of payment methods out there, it should be enough for one’s needs. There is also a 90 day refund policy that you can find on the terms of service page, but there aren’t many scenarios that would qualify you for a refund, and they do mention that it’s done solely at their discretion. The easiest way to test the service out before committing to a long-term plan is the 2-day for $2 plan which should give you more then enough time. There is a considerable discount available through stacksocial which allows you to purchase a lifetime subscription for just $39.99. This is a great deal, that is if the service is enough to suit your VPN needs. The technical support team was very helpful, their chat services is online 24/7 and all our questions were answered in a timely and professional fashion. The customer service assistant always provided us with links and documentation regardless of the nature of our inquiry, which we find refreshing. It’s good to see that they take their customer support seriously since in a lot of cases it can be a real deal-breaker. In short, we feel that VPNSecure has a lot of potential and is going in the right direction. There are however some things which in our opinion require their immediate attention, so here is a quick list of what we liked and what we didn’t. Easy to use website, applications and service all-together. A decent number of payment methods available. Proprietary applications available for all major operating systems. 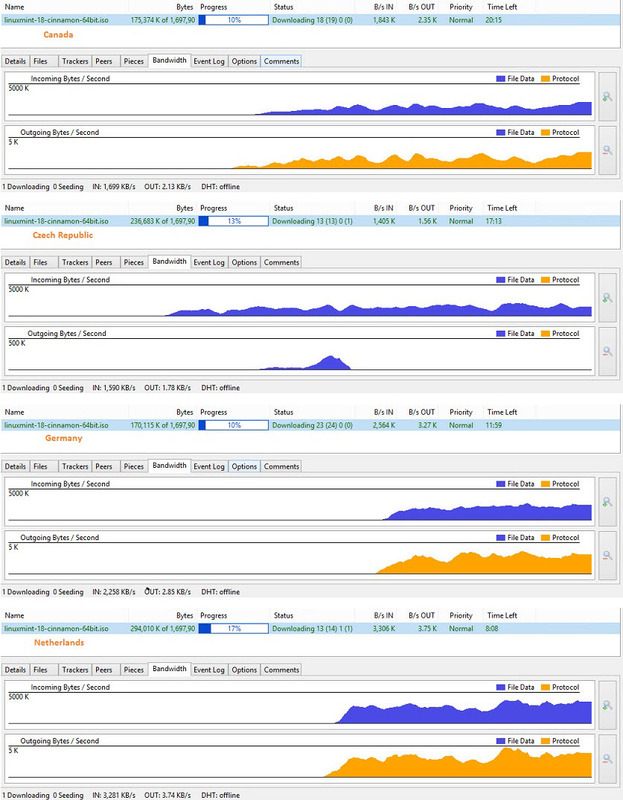 Only average browsing and rather poor P2P performance. Poor encryption used – DES-CBC 64 bit which is obsolete. Features such as PPTP and web proxy charged separately (and quite expensively we might add). Expensive service all-together, especially when you take the performance into consideration. Due to the mentioned factors, we award VPNSecure with a 5/10 due mostly to the poor encryption used, poor speed test results and high prices. We feel that once the infrastructure is optimized to sever the number of clients and once the price is adjusted to fit the service, VPNSecure will have its place established in the VPN market. It is an awful VPN provider. I wanted to watch and subscribe to beinsport. I contacted before I subscribe to see if it was possible. They told me that it was definitely possible, and lots of their customers watch bein sport. I was happy about it and then I subscribed to their VPN. I tried to subscribe to beinsport online it was not possible as probably they knew that is was coming from the UK despite the fact that I was using their Egypt server. I contacted their customer service and told them I was not able to subscribe to them as they told me I could. Initially, they started to blame my email then started to blame the bein sport web site. I asked them do they have technical support. They told me they do not have such a support. I told them I want my money back as they had told me a lie. They told me shamelessly that as I was able to connect to the bein sport web site they could not give my money back. I told them any web site could be accessed via the internet and one does need a VPN. They were shameless and did not have any answer to this and they refused to refund me despite had misled me. Please do not use them as they are not honest, they do not have technical support and you can not unblock any geographical restriction. Please do not listen to their promises etc. website is a scam, asked for a refund because the 20 proxies they supplied me did not work, 9 days later they finally tell me they have refunded me, to tell me they refunded my money to a website called ”coinbase” because ”this is how they refund bitcoin payments” funnily enough i told them my EXACT bitcoin address they could refund me to a WEEK before this happened, this company is now telling me i must make an account on coinbase to get MY money back? that THEY incorrectly sent to another website? i am truly lost for words when talking about vpnsecure, you are best avoiding them and using a REAL website that does not scam its customers. Bought the service today and it works just fine. Not an extensive test and I am not going to use it very much. Just to access specific sites from another country ip, from time to time. I chose it because it has many countries which I wanted and most other pvn softwares dont have big country list, (also because of the good price deal I got) and because it has good reviews elsewhere. I dont mind the Australian 5 eyes, nothing illegal to use it for. But the 3-4 countries I tried today, all worked fine. Setup was easy and fast, not even PC restart.